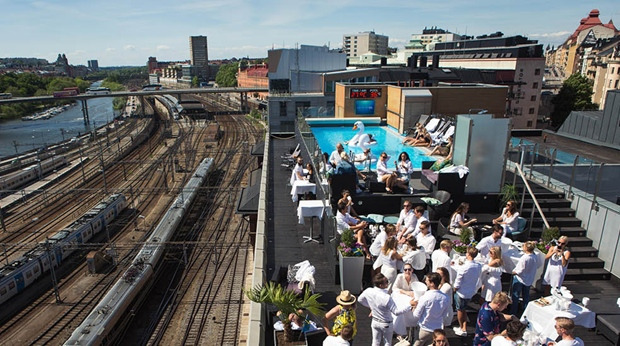 Who can actually sum up the appeal of a rooftop bar? Is it just that the dizzying sense of height enhances the flutter of excitement of being out, all dressed up with a drink in hand? Is it that sense of removal from the world ‘down there’, with all of its blaring horns and frenzied pedestrians? Whatever it is, the allure is strong - so leave your vertigo at home and get high. 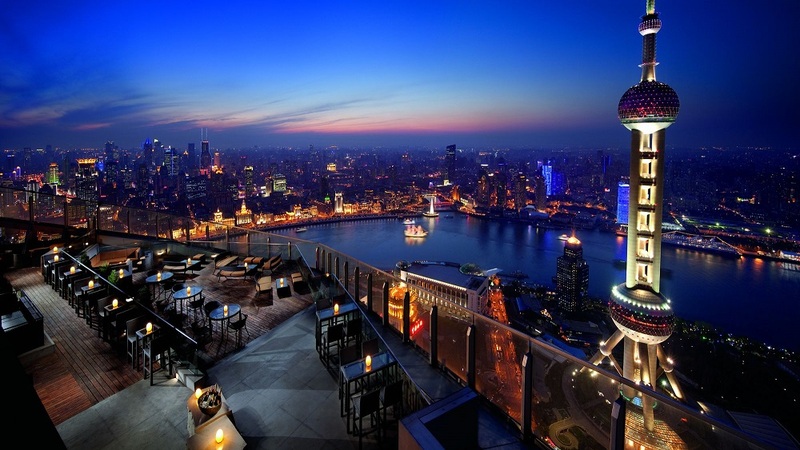 Perched up on the 58th floor of the Ritz, with outdoor lounges temptingly inviting you to sink into them and take in the broad views of the surrounding city, the Bund and the Pearl Tower, Flair is rammed with revelers on warm days. Food is tapas style, with an emphasis on Asian flavors; there’s also 40 types of vodka to make your way through, as well a comprehensive cocktail list. High above Singapore’s business district, at the top of One Raffles Place, 1-Altitude Gallery and Bar is the highest alfresco bar in the world, boasting 360 degree views, which take in the vast and luminous cityscape as evening descends. Head here not only for elegant and creative bar food and an extensive cocktail list, but to take to the sunken dance floor and let loose to a backdrop of live DJs and irresistible tunes. So achingly cool that it’s only open to the public on Monday to Friday (it’s reserved for private hire on weekends) you’ll need to get your Skylark fix on an after-work pitstop if you want to enjoy its sensational views, which sweep over Manhattan’s most iconic architecture, such as the Empire State and Chrysler Buildings. At 30 stories above Times Square South, the venue attracts a slick midtown crowd, so be dress code savvy. With its name meaning The White Bird, this restaurant and terrace atop The Peninsula Paris celebrates the vintage age of aviation and the French pilots Charles Nungesser and François Coli who, in 1927, attempted the first Paris to New York transatlantic flight on a plane of the same name. The interiors reflect the theme - yes, that is an actual plane - as does the drinks list, which features cocktails with names like Take Off. Leave your goggles and helmet at home, though - just soak up the views of this most romantic of cities. 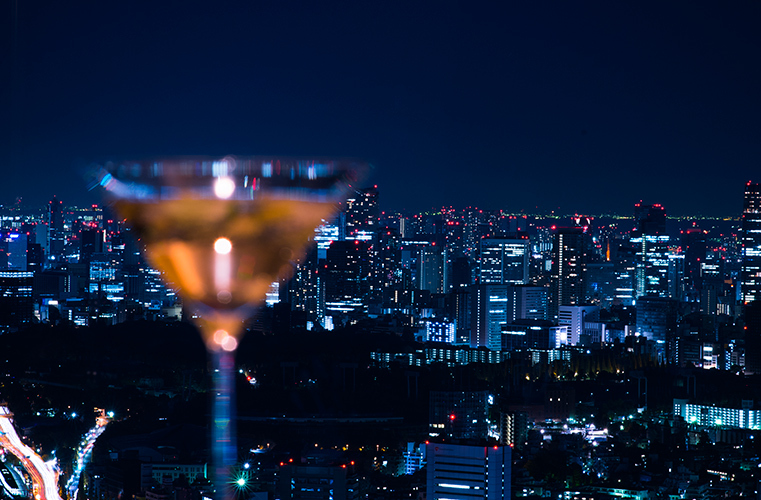 No doubt you’ll recognise this venue from Lost in Translation: on the 52nd floor of a Tokyo skyscraper, this atmospheric bar has all the views, as well as nightly jazz performances. Downsides? Smoking is permitted and, unless you’re a hotel guest, you’ll be charged an entry fee. 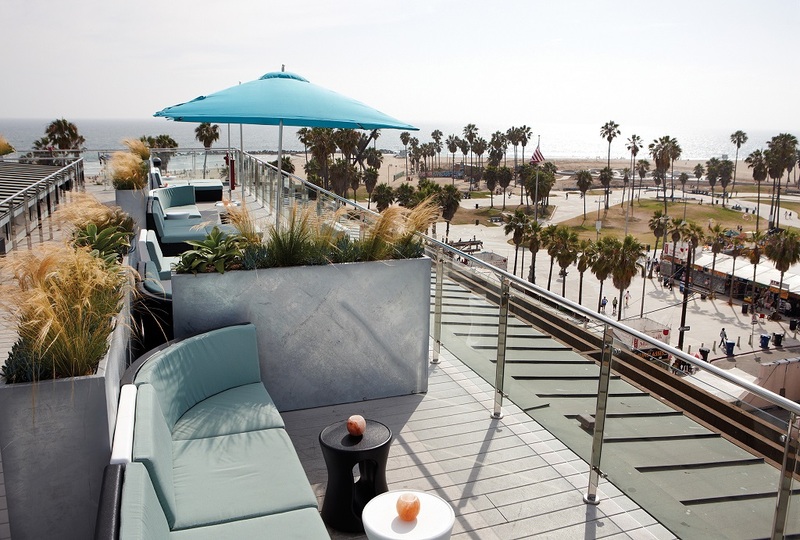 This is the only rooftop kick-back bar in Venice but even if it had competition in the area, its fabulous people watching, Instagram-envy inducing sunsets and panoramic views, plus live local DJs would undoubtedly make it the most popular. Sink into their cosy couches and enjoy a signature cocktail or bottle of wine. Chilly? Blankets are available on request; on the other hand, sunscreen and sunglasses are also available if those rays are intense. It’s located right next to The Bank of England, so that should immediately give you some idea of the prices and clientele - but even if you have your doubts about the English weather, you can be sure that the terraces are covered and heated, to keep those Savile Row suits in spotless condition. 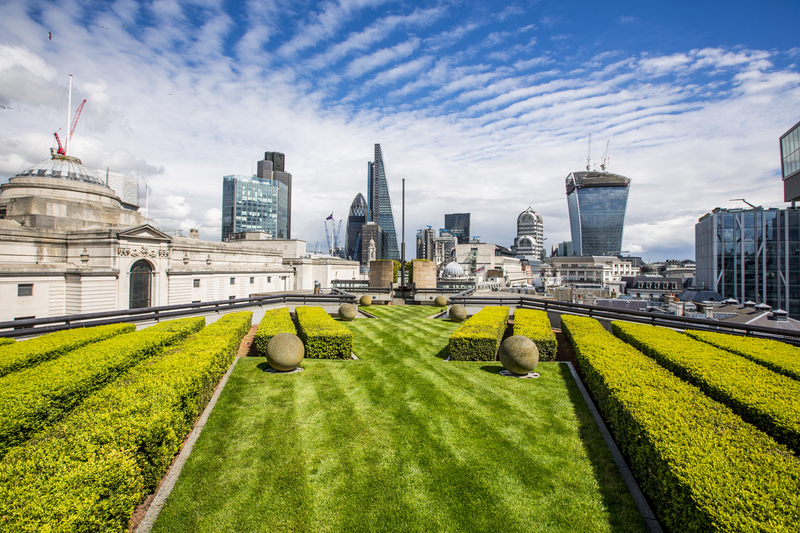 Lush lawns and box hedges summon up a garden party vibe … a million miles from the madcap pace of the city, far below. With Juvia’s gorgeous living wall, clean-lined decking and neutral decor punctuated by deep purples, you’d never guess that you were on the roof of a parking garage. 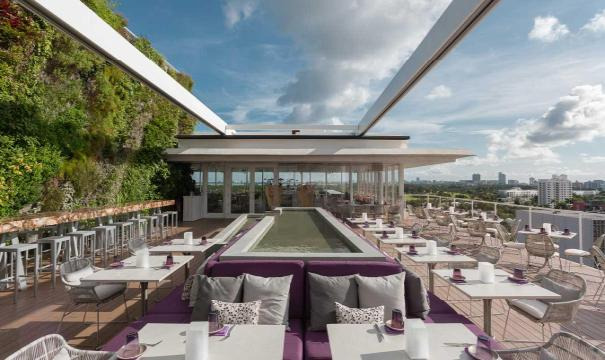 French, Peruvian and Japanese cooking styles are the kitchen’s holy trinity, all washed down with a signature cocktail - try the Hurricane Juvia - against a backdrop of Miami Beach views. 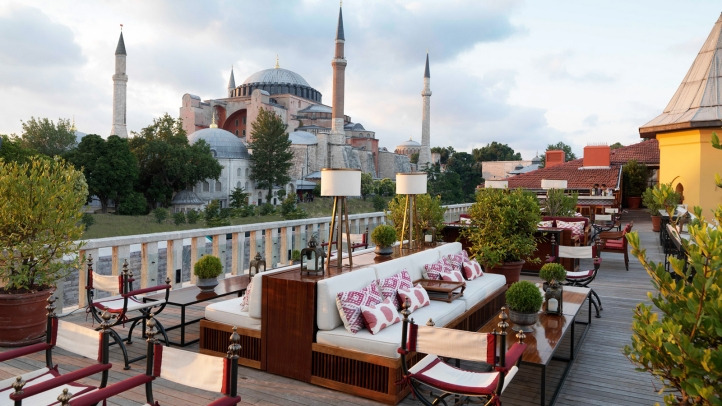 More a spot to chill out from the bustle below than a place to get your party vibe on, Istanbul’s splendid sights are perfectly showcased for you to admire while enjoying a sedate beverage or two. The Blue Mosque’s minaret and the hulking grandeur of Hagia Sophia are paired with the dazzling aqua of the Bosphorus; for an authentically local experience, request raki balik, a local aniseed liqueur complemented by seafood dishes. Where to strike the perfect Insta pose? Against the Philip Stanton rooftop mural, or with Gaudi’s iconic Sagrada Familia in the background? Heck, do both - and extend that ‘have it all’ attitude to the menu, which features Nandu Jubany creations like artisan burrata with grated tomato, and a veal tenderloin in coca sandwich - all washed down with jug after jug of fruit-packed Sangria. 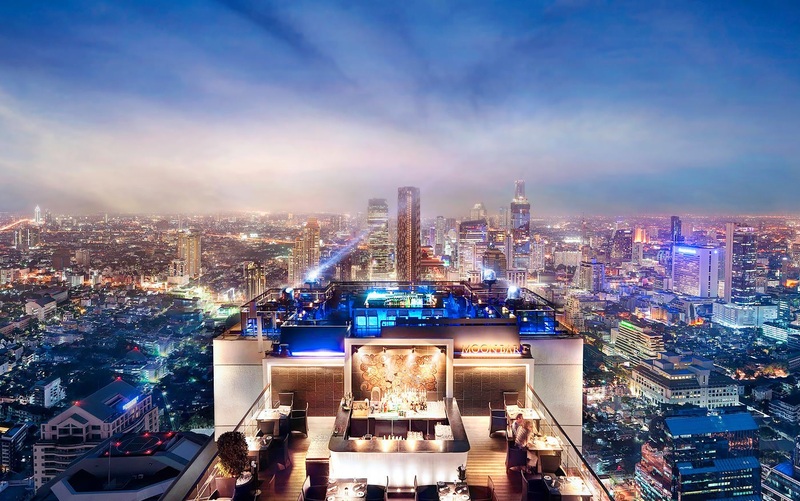 A dizzying 61 stories above Bangkok’s frenetic pace, you can definitely expect endless 360-degree views of the city when you ascend to this favorite nightlife haunt, which occupies the entire top level of the sophisticated Banyan Tree hotel. Cocktails are pricey, but the sunset views make it more than worth the spend. 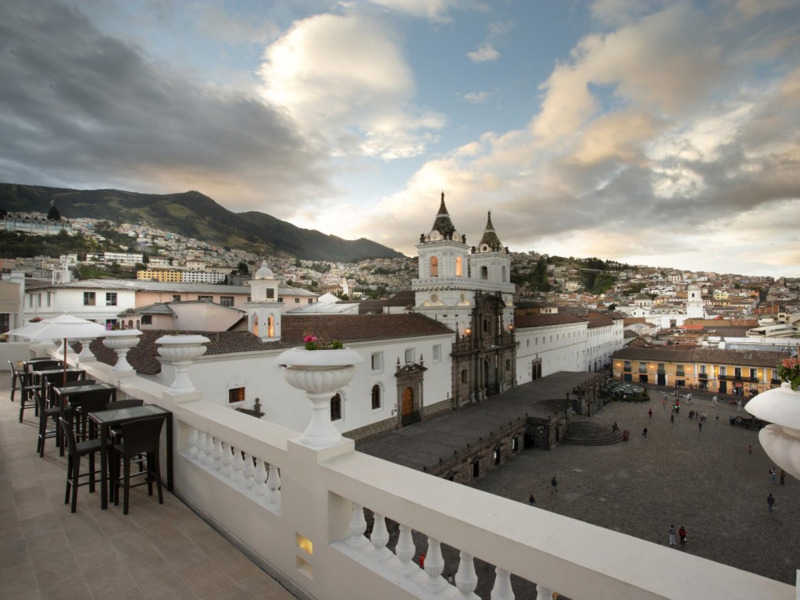 On a clear day, you might be able to spot the snowy peak of the Cayambe volcano from this third floor rooftop bar; otherwise views of the world’s first UNESCO World Heritage site, Quito’s mesmerising Old Town, provide more than sufficient eye candy, with church upon church to be seen. Small and intimate, this hideaway at the top of a restored mansion is an utter delight. Beautiful people galore, not to mention seriously good pizza - which, to be honest, it doesn’t look like the clientele have ever touched in their lives - especially when they get into to the pool at this rooftop spot. 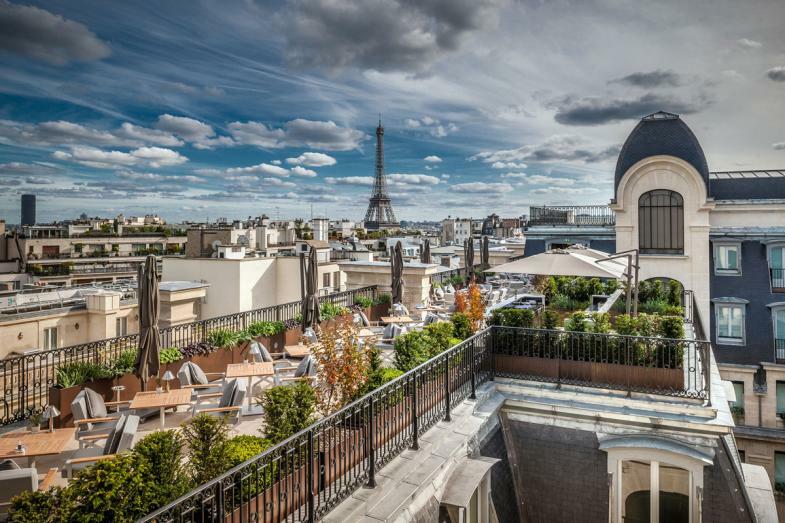 This is a place to see and be seen, so leave your inhibitions at home, or at least give your confidence a boost with a pricey-but-worth-it cocktail in your hand. 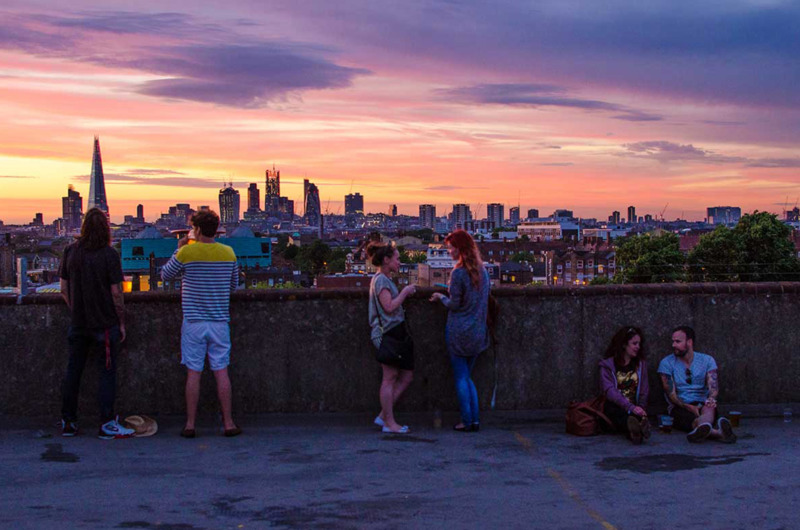 It’s only open for a few short months each summer, and unfailingly draws crowds to its rooftop perch above a multi-story carpark in South East London. Each year, a collaboration with cult art collective Bold Tendencies gives Frank’s a different look; in terms of the clientele, think hipster central, but definitely not trying too hard. Campari-based drinks are de rigueur here - hold yours up against the sunset for the hashtag-ultimate shot. 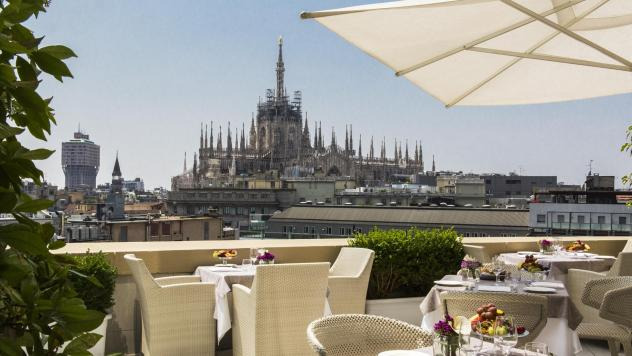 From a vantage point on the 8th floor of this well-placed Milano hotel you can feast your eyes - from behind oversized sunglasses, of course - on views of the city’s famous Duomo. Head here for an afternoon aperitivo, settle into the chic white surroundings and stay on for an evening meal - all of the chef’s pasta and sauces are freshly made on the premises. 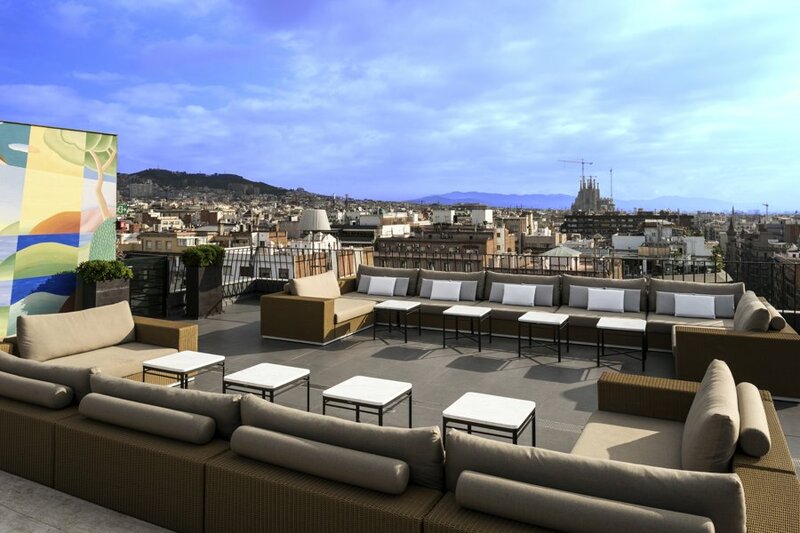 If you’ve ever wanted to feel like you were in a music video, this rooftop bar, with city and sea views in every direction, will tick several of your wannabe boxes: think multilevel gardens thronged with jetset crowds downing magnums of Champagne as casually as if they were Pepsi. Low, lazy sofas offer a reprieve from the dancefloors when those heels start to make their presence felt. Lisbon is a city of hills, so your peregrinations will inevitably afford you splendid views. They’ll also give you aching legs, so take a load off and head to Memmo Alfama for an evening drink as the sunset washes the city in shades of pink and orange. Far below, impossibly vast cruise ships occupy the port, while the spires and roofs of the city provide charming textural views in the other direction. 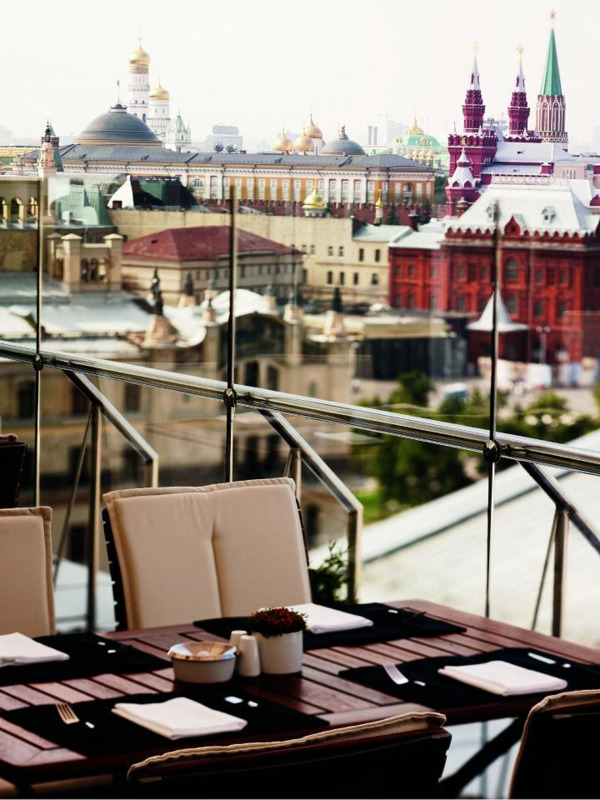 Located on the tenth floor of the Ararat Park Hyatt in Moscow, you can indulge in quintessentially Russian flavors here - think pancakes with caviar, or borsch - all of which can be savored as you take in views of the Kremlin, Red Square and Bolshoi Theatre. Outside tables are highly prized: arrive early, or content yourself with an inside spot from which a glass wall makes the views still accessible. “Come as you, leave as a star’’ is the cheerfully encouraging motto of this sleek confection of granite and marble, located on the 8th floor of the Clarion Hotel Sign. 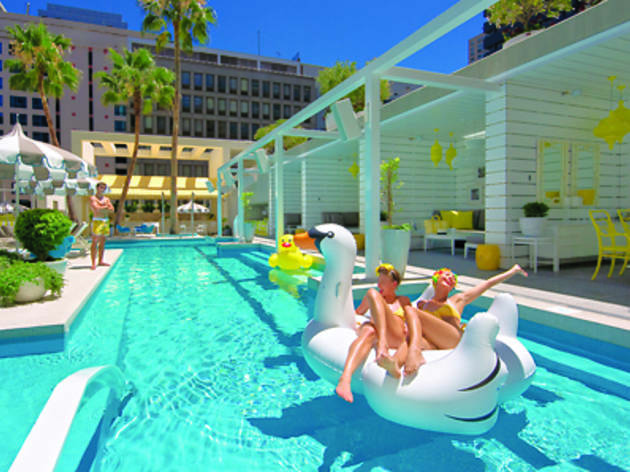 Take a dip in the heated pool with a glass of bubbles, swathe yourself in towelling robes and views of the city, swing in a perspex bubble chair and feast on health-conscious dishes, like blackened salmon and raw vegan ice cream. 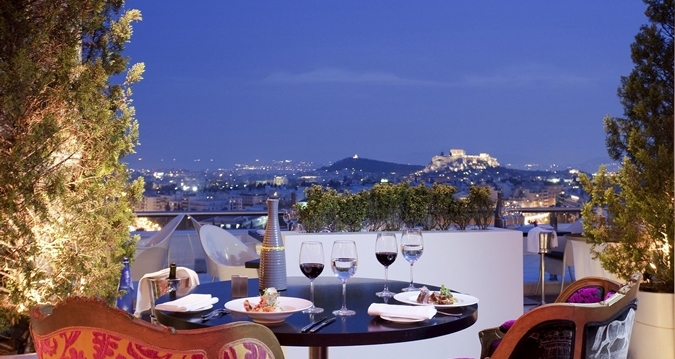 Ancient meets modern and quintessentially Greek meets undeniably global in a seamless blend of wonders at the Galaxy Bar. As you gaze upon the impossibly ancient sights of the Parthenon and Acropolis from the open air terrace, you can be feasting on distinctly non-Hellenic sushi. Taking its name from the galaxy-inspired ceiling that canopies the restaurant, cool music and premium spirits only add to the allure of the view which, on a clear day, can extend as far as the island of Aegina. 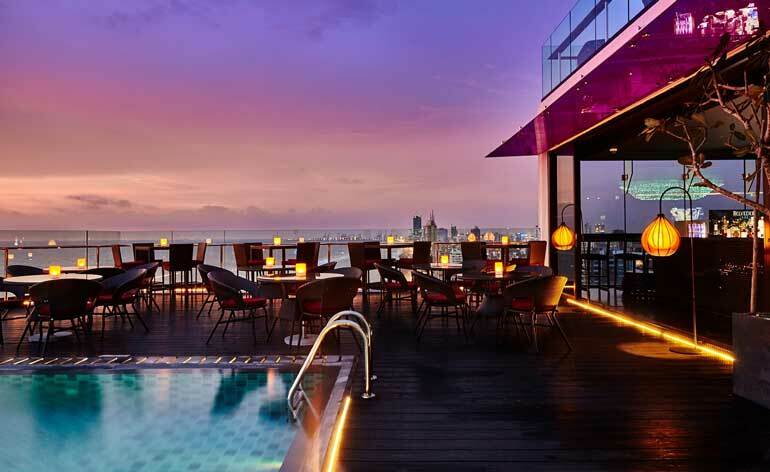 A relatively recent addition to Colombo’s burgeoning nightlife scene, this bar is on the 14th floor of the OZO Hotel, and has all of the elements for a successful rooftop bar recipe: louche loungers, an infinity pool and, of course, superlative ocean views - not to mention bar tapas, a killer drinks menu and live entertainment. Unsurprisingly, it has quickly become one of the hippest spots in town. 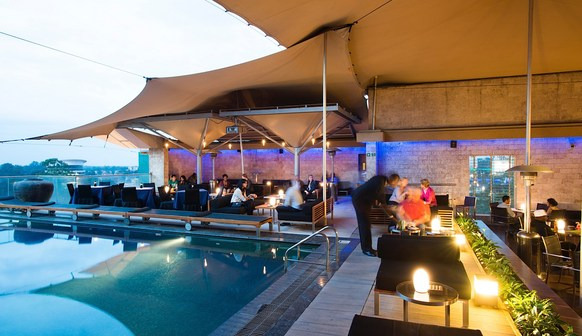 With its glorious views over Nairobi’s skyline, Sarabi’s daytime vibe is one of casual coolness, with its open air pool and wellness-focused food and beverage offerings. After dark, it takes on a different aspect, setting its halo at a rakish angle and getting the night going with live music, DJs, shared plates and buzzy ambience - all lubricated with expertly mixed cocktails. 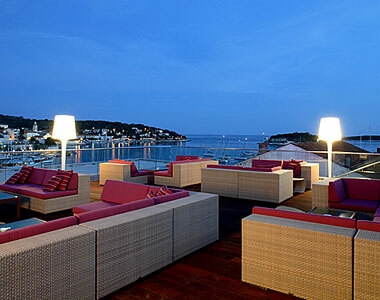 It’s the party capital of the world, so what list of rooftop bars would be complete without an offering from Ibiza? 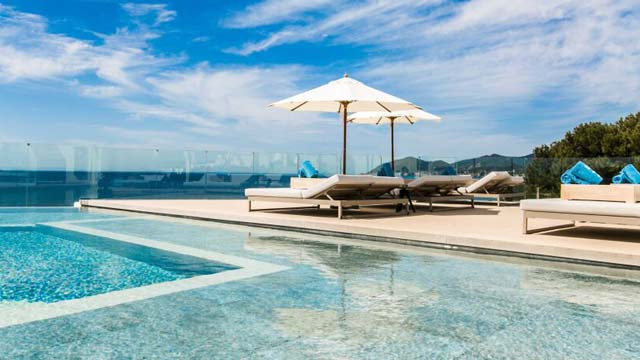 Utterly uninterrupted views of that gorgeous sea can be enjoyed, either from your Balinese style lounger, or from the cool relief of the infinity pool. 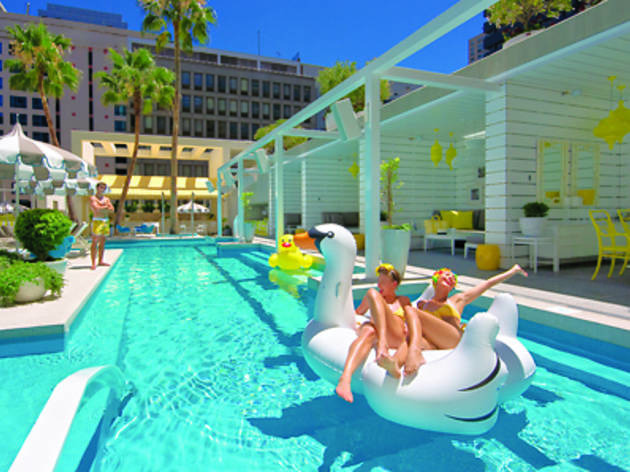 Along with the backdrop of cool tunes and ambient beats, you can soak it all up with a cocktail in hand, taking full advantage of the poolside service. 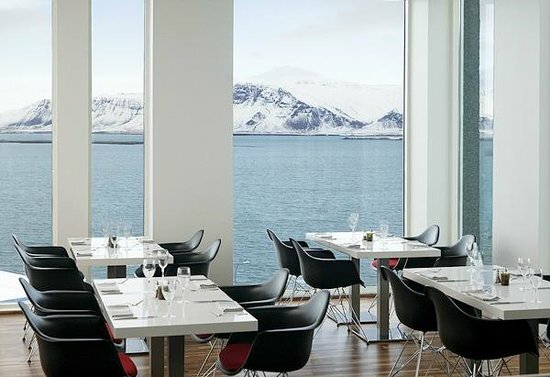 Set atop the 8th floor of a hotel in downtown Reykjavik, SKÝ ticks all of the boxes in terms of views - Faxaflói Bay, Harpa Music Hall and Reykjavik harbour are all right there for your visual enjoyment. Signature cocktails - combined with the bracing Icelandic air - will get your buzz on - and if your blood sugar needs a touch of stabilizing, head for the bar menu, which features fresh, local ingredients. 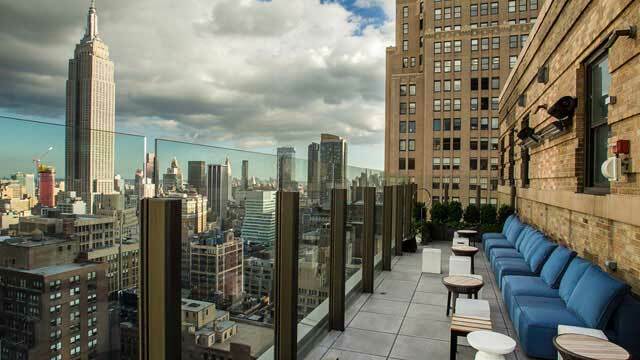 NYC has no shortage of hip rooftop bars with which to lure locals and visitors, so the fact that Mr Purple has captured - and continues to capture - the attention of revelers is testament enough to its appeal. 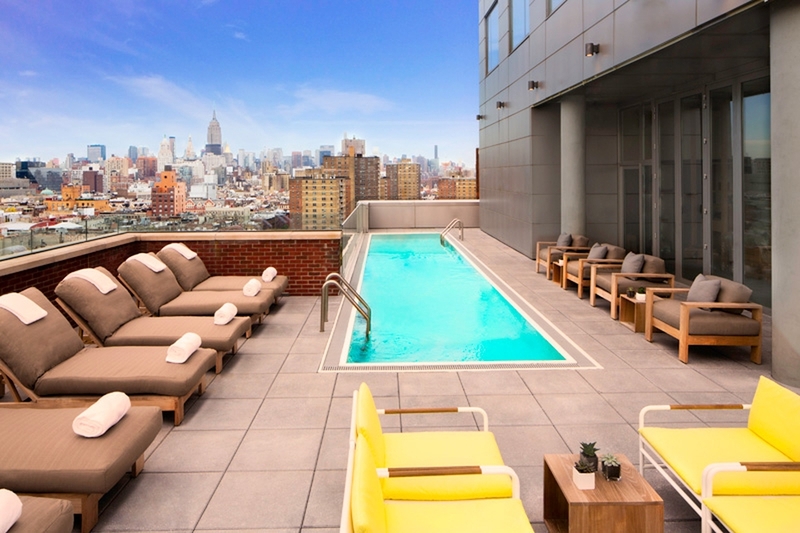 Up on the 15th floor, this sprawlingly elegant space blends concrete, recycled wood and metal, alongside 360-degree views of lower Manhattan, as well as a plunge pool and lounges for when standing up is just too much trouble. Bookings aren’t taken, so bear Mama Shelter’s hipness in mind and arrive in time to secure your spot with a view - and what a view it is, spanning all the way from the legendary Hollywood sign to Downtown, and from South Bay to Westside. 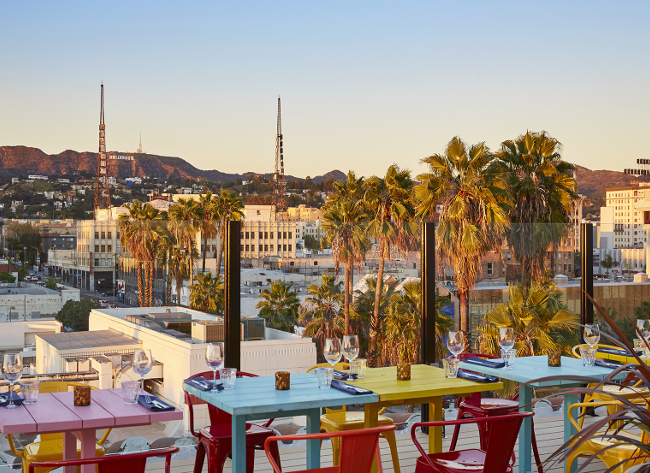 Located just a stroll away from the Hollywood Walk of Fame, this bar offers bright, modern decor and innovative cuisine. Sunset cocktails are a must but make sure you also head here on a weekend for Mama’s legendary brunch, with both clean and dirty indulgences served up, quite literally, on a plate. 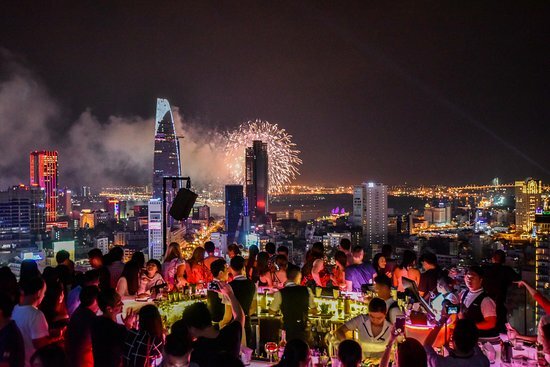 It’s worth delving into the almost overwhelming assault on the senses that is Ho Chi Minh City by day, if only to marvel at how remote the madness seems when viewed from the dizzying heights of a rooftop bar by night. 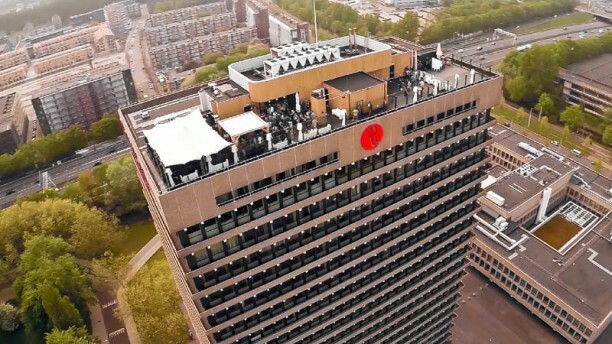 Chill Sky Bar, in District 1, occupies a lofty 25th floor position and attracts a well-heeled crowd: dress to impress if you want to make it past the doorman and onto the dancefloor, where the vibe is orchestrated by the city’s most talented DJs. Hong Kong has its fair share of rooftop bars - why wouldn’t you, in a city with so many dizzying high rises on which to position them!? 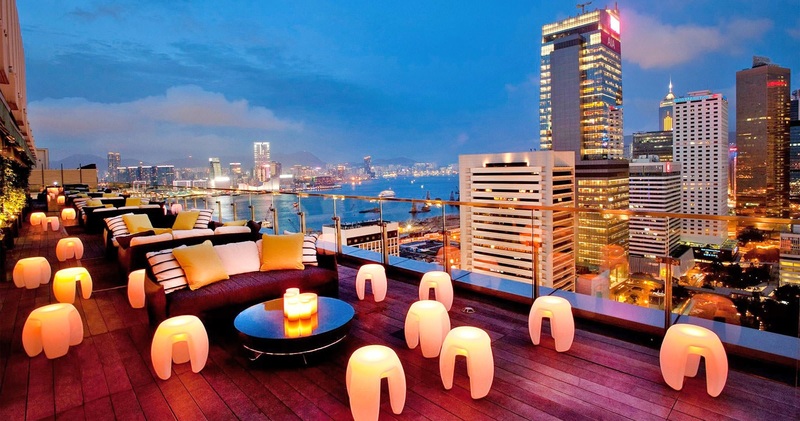 - but Sevva is the one that keeps you coming back for more, with its air of sophistication, award-winning cocktails and epic views of Hong Kong, Kowloon and Victoria Harbour. Regulars are spared any sense of ennui, with a design scheme that changes regularly; you’re also in prime position for the nightly Symphony of Lights spectacular, which washes the city’s buildings in a dazzle of color and sound. Banish thoughts of back-to-basics which, if we’re honest, is what the name “Ramada” seems to conjure up. 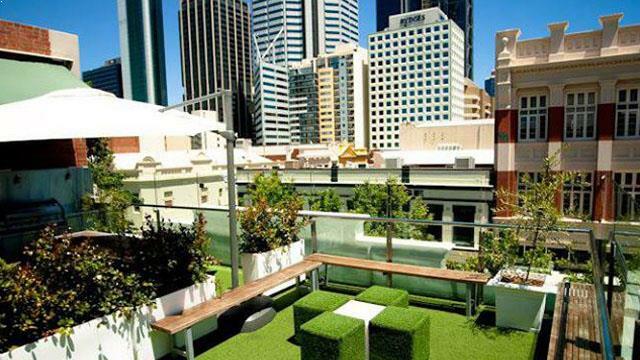 On the 17th floor of this one, you’ll find a rooftop bar - the city’s highest - that plays host to outdoor cinema nights, during which you can lounge on beanbags whilst drinking cocktails. The fun doesn’t stop when the colder months come, however - in winter, the space is transformed into an ice skating rink, with the city twinkling beneath you as you glide around.